By any standards, the United States boasts some truly worthwhile winter getaways, from the blue shores of Lake Tahoe, to all those East Coast resorts that try to compete with their Western counterparts yet never do. Out in Colorado, a state known for its generous mountain profile and equally epic outdoors scene, a major holding of winter locales are routinely bustling with activity and serving up satisfied customers. Bullz-Eye was given the chance to experience a few days at Breckenridge, one of the premier resorts Colorado has to offer, during one of its most enjoyable times of the year: Ullr Fest. When I first got the email regarding Ullr (pronounced Ooler) Fest, I was in a state of complete darkness as to the meaning. In the back of my head, crude images of massive stone hammers and snowy, bearded warriors filled the void, vainly trying to conjure up any sort of applicable knowledge. 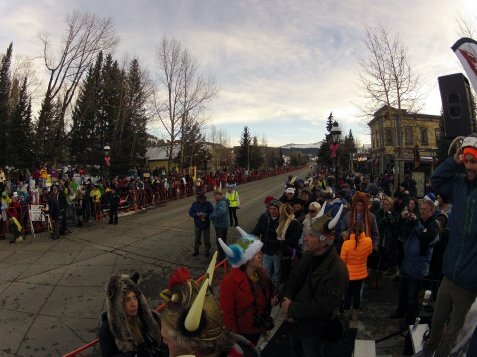 It turned out my premonitions weren’t completely off, and the whole celebration was in fact Breckenridge’s way of honoring the Norse god of snow, Ullr. All people who share a love for the outdoors have some sort of relationship with the weather. Cyclists pray for absence of rain, surfers yearn for hearty swells and so on. Snowboarders and skiers have that similar connection, yet take it to a whole other Bobby and Whitney sort of magnitude. The degree of snowfall can literally make or break half of the year for those who passionately delegate an entire season to winter sports. On a grander scale, resorts can lose significant amounts of revenue due to lackluster precipitation and the disinterested wake that follows. Dane, Thrillist: More or less average build, with a clever and hilarious way of adding to every conversation and setting. Mannerisms similar to comedian Dane Cook. Seth, Maxim: Nickname earned due to his uncanny facial similarity to Seth Rogen; if it weren’t for his towering height, he may actually be a full-fledged twin. Drew: Pleasantly down-to-Earth, yet seriously extensive in her knowledge and passion for the area. Drew Barrymore doppelganger. Daphne: Beautiful, interesting and once from Seattle. Being that Martin Crane’s physical therapist is just about the only female I know from the area, the nickname will have to stick, and yes, that was a “Frasier“ reference. Kanye: The mastermind behind the entire organization and execution of the trip. A true professional, and much like the aforementioned rapper, Chicago raised. Can’t give me a ride? Two hours ago would have been a perfect time to drop such a bomb, but not now. Oh well, I quickly thought, all is not lost – Go-Go Gadget Drive Myself. I flew down to the car and punched it aggressively for the next hour, cursing the heavily inundated 19th Avenue of San Francisco and looking at every red light as if I had never seen such an atrocity before. As I neared the airport, the horrible realization was that I had zero time to drop my car in nearby Millbrae and instead was forced to throw up a Hail Mary. I drove straight into 2-hour parking, tossed my luggage outside, and then left forty dollars, the parking ticket, and my car keys in a tissue box deep inside the trunk. The final touch was the front door unlocked and a text message to my buddy who lived a short distance away, pleading with him to grant me this one favor. After the day unexpectedly morphed into such a hectic beast, I was overjoyed when the plane touched down in Denver and I was soon aboard the hour and 40 minute shuttle towards Breckenridge. Something needs to be said about the drive up to Breckenridge. The road lazily tilts upward and soon you get the feeling that an ominous space mission is being made into the dark skies, ear-popping and all. It was throughout the drive that I found myself laughing at our shuttle driver, Ted; not at him personally, but at the routine which followed whenever he chose to make but the slightest change in heater settings. He’d crank the dial ever so slightly and almost immediately, a reprieve would echo from the shadowy passengers in the rear. “Umm, Ted, can you turn that down a hair?” or, “Ted, could you make it blow less? Like, the temperature is okay, but there is a lot of air coming out, right on my head,” and further, “Ted, the passenger in the back would like it to be a bit colder. Thanks.” This pattern repeated itself multiple times, to the point where the lady in the front seat reached over and patted his shoulder, saying, “You’re doing great, Ted.” This made me laugh.